Los Angeles 5 hours DVD The lecture was about recognizing and removing the masks in order to discover deeper levels of who we truly are. 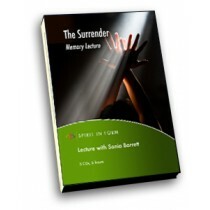 Sonia Barrett’s Memory Lecture titled “The Surrender” in January 2009. Here she shares mediation techniques she discovered on her own not having any clue on how to meditate in the early stages of her spiritual quest. The lecture was about recognizing and removing the masks in order to discover deeper levels of who we truly are. Sonia took the group on a journey of dismantling old religious and spiritual programs which may no longer serve the current level of their journey. Sonia also shares mediation techniques she discovered on her own not having any clue on how to meditate in the early stages of her spiritual quest. She discussed the science of possibilities and potentials. Surrendering to freedom from external packaging of what your potentials are as an unlimited being.